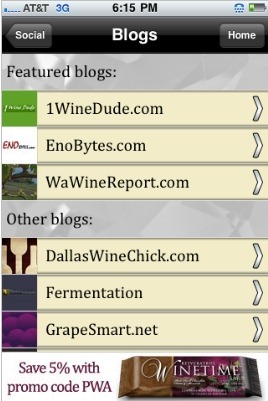 In my ongoing effort to, uhm, branch out in the wine world (read: get paid), I’ve got myself involved in a couple more ‘extra-blogger’ activities that I thought I’d share. They are geared more towards beginner (I know, I hate that term too, but I can’t manage a better one) wine enthusiasts and so I didn’t feel that they were a fit for 1WineDude.com, but some readers might find them interesting (or doubtless you will know someone who might – which might buy you a day or two of respite from those folks asking you for wine advice!). 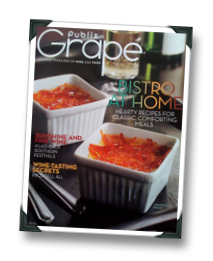 First, I’ve contributed some wine recommendations to the Fall 2010 issue of Publix® Grape Magazine. My contribution was made so many months ago that I don’t in fact remember what I wrote for them… and I don’t live in a state that has a Publix… so any of you in the Southeast U.S. who can refresh my memory, please feel free to help me out… Anyway, if you live in Florida, Georgia, South Carolina, or Alabama you can subscribe to receive the magazine for free. Because, you know, free is a good price. 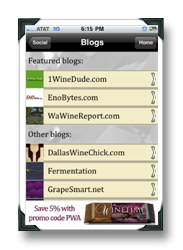 Second, you’ll start to see my reviews pop up on another iPhone app (also coming soon to Droid and Blackberry), Pocket Wine Assistant, in their new version. Because, you know, one can never have too much 1WD in one’s pocket, right? That, and I’m fond of over-extending myself. Anyway, more to come on that when he new version is released. Third, I’m contributing (ongoing, this time) to a very cool on-line Philadelphia food & drink publication called Table Matters. 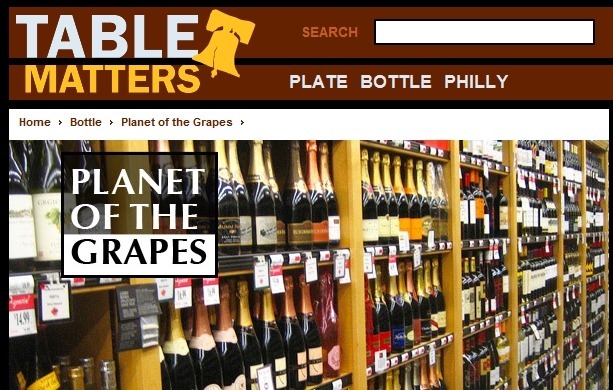 I’ll be penning articles in the awesomely-named Planet of the Grapes section (“It’s a madhouse! A MADHOUSE!! !”), the first of which appeared last week. 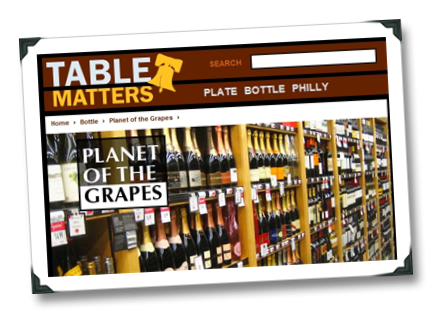 Table Matters is a Philly-focused publication, so I’ll be covering wines available in the Philly/PA market. Because, you know, I enjoy a challenge. Your thoughts, as always, are welcome – including story ideas for the Table Matters column (just don’t expect a cut of my fees…). Are you calling me a beginner? (because I am). Glad to hear about all you are doing! Well, Mary, I've never viewed the term as derogatory :-). 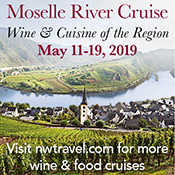 In fact, when it comes to some wine regions (hello, Burgundy!) I'm a total beginner myself! Cheers! This affordable everyday quaffer is a perfect introduction to ripe Viognier and offers surprising complexity and balance for the price. The nose has waves of pear, honeysuckle, melon and even some tropical fruit notes. The palate and mouthfeel are nice and full without being overbearing. The best part is that given its full-bodied nature, you can pour a glass of this for a friend who "only drinks Chardonnay" and they won't suspect a bait-and-switch until they're already enjoying it." I know Smoking Loon has its detractors, but I've lost count of the number of people I've turned onto Viognier after recommending that they give that wine a try – and I still think it's a great deal for the price. Congratulations on branching out! I've got some good friends in Philly who, I'm sure, will be interested in the new Table Matters (especially when the site's home page right now speaks of "The Epic Donut Bike Ride"). I'll send them along your way. PS, I didn't grow up in the South, but I live with someone who did . . . and Publix has inspired nothing much short of a cult down there. 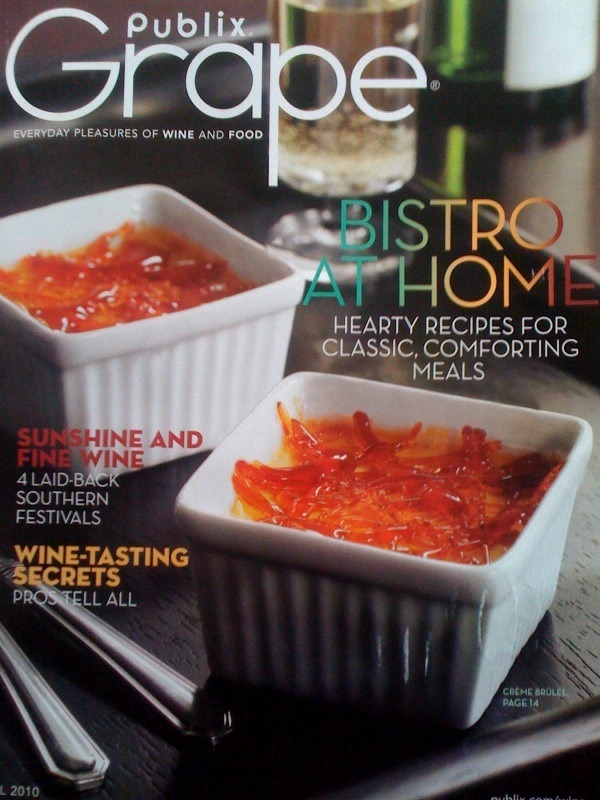 Their Grape magazine may be free, but it's still a Big Deal. Have you thought about writing comedy pieces? The Hosemaster seems to be on sabbatical–so there is an opening. Of course, he never made a dime at writing about wine so you are already ahead of him. You could also write poetry. We can never have enough wine poetry. By the way, how do I get a user number? 101 points on the 100 point scale is quite an achievement. Does Rbt Parker know? Hey pops! I prefer the term "poesy."